CDR FoodLab® Range analyzers have been showcased in two different trade shows during last weeks. At the beginning of March our food analysis systems were in Dallas, TX, thanks to our north american distributor Crystal Filtration. Here SNAXPO 2014 took place from the 1st to 4th of March. SNAXPO is the world’s largest and most comprehensive trade show for the international snack food industry, this year convened at the Kay Bailey Hutchinson Convention Center of the Omni Dallas Hotel. It was a very good occasion to meet companies and to show the systems, that can be used to improve the snack production through a rapid simple and reliable analysis of matrices like fats, oils, hot oils or used oils, nuts, chips, snacks and biscuits. For example, CDR FoodLab® can be useful for quality control or for checking the shelf life of the matters. Besides at the end of March you could see demos of the food analysis with CDR FoodLab® systems at Foodex UK. It was in Birmingham, at the NEC conference center from the 24th to 26th of March. 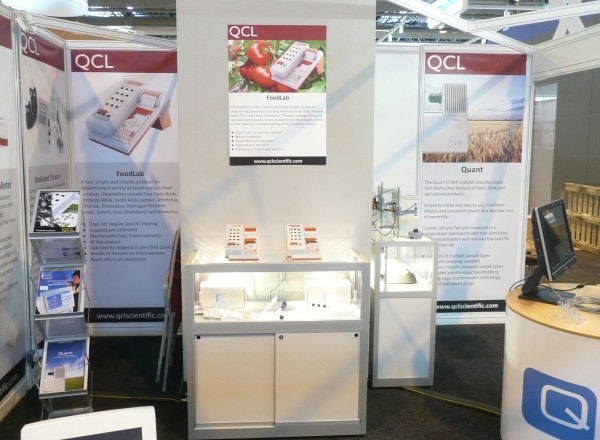 QCL is our English distributor that had there a stand for showcasing and meeting visitors. Foodex show collects specialists and insiders for processing, packaging and logistics for the food industry. It is a very important appointment during which QCL team could illustrate the instrument, the analytical parameters and the CDR FoodLab® analysis method. Visitors could test themselves the analyses. QCL at Foodex collected a great success. Click for more information about CDR FoodLab®: Simple method, reliable results in few minutes. Showcases of the analysis of foods and drinks with the CDR FoodLab® systems was last modified: May 30th, 2017 by CDR s.r.l.